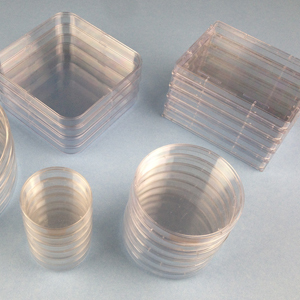 The Universal Plate Pourer can fill Petri dishes in three standard formats: 60 mm, 90/100 mm, and 150 mm. It can also pour ANSI/SBS (128 × 86 mm rectangular) and 100/120 mm square plates. The automated media filler accommodates wide variety of sizes and styles within each format, so there is no need to use plates from specific suppliers or to adjust the pourer in any way. With angled nozzle outlet and precise positioning of the nozzle tip, the media is dispensed quickly and bubble-free, regardless of the media type used. 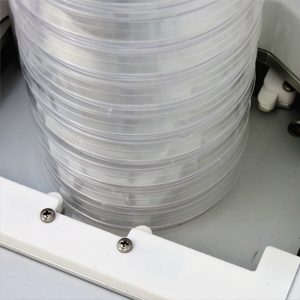 High-quality media tubing and peristaltic pump with calibration feature allow dispensing of precise volumes at high flow rates. 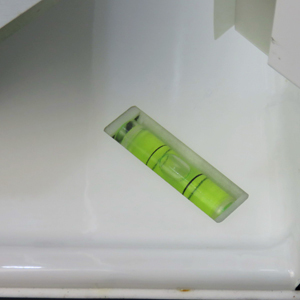 The plates are opened and the media is dispensed inside fully enclosed cabinet. 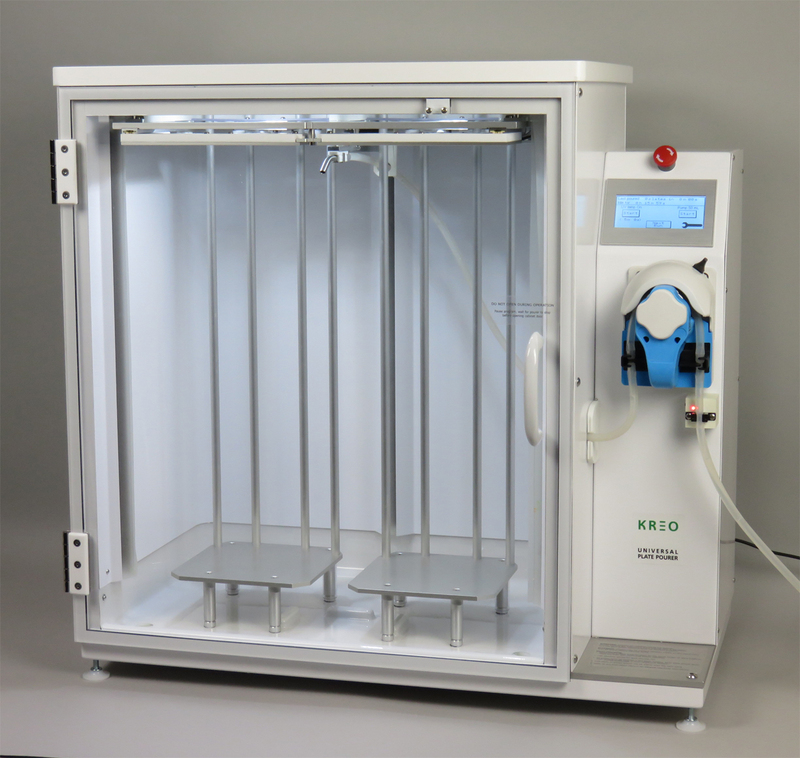 Germicidal UV lamp can be used before a series of pouring runs, or can be programmed to turn on before and/or during each run. The cabinet’s tub-shaped bottom will contain any spills. 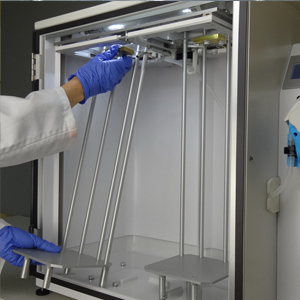 With smooth, rounded walls and instantly removable plate racks, the cabinet is easy to clean and decontaminate. At the start of a new pouring run the Universal Plate Pourer automatically identifies the plate format and selects the corresponding set of operating parameters: the pouring volume and speed, nozzle location for dispensing and UV settings. It then proceeds to fill the entire batch of loaded plates. The touch-screen graphic user interface is simple and intuitive. It provides easy access to all controls and user-adjustable parameters. 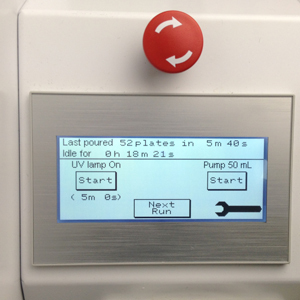 New users can access on-screen step-by-step instructions that help them prepare and start a new pouring run. Optical and tactile sensors on the plate grippers work together to identify and locate the plates and to detect any irregularities, such as misaligned or damaged plates. 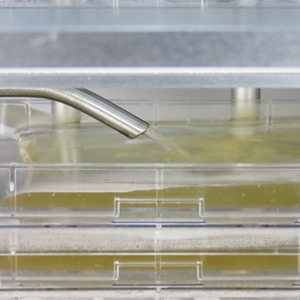 The non-contact liquid sensor for the media tube prevents spoiled plates by detecting air bubbles before they reach the plates. The cabinet has leveling feet and built-in level indicators to help maintain uniform thickness of liquid media in the plates. The Universal Plate Pourer is compact and weighs only 24 kg – less than half of a carousel-style pourer’s weight.